Took a gravity reading and no further change and it's down to 1.01..low enough to get me a 5.2% ABV which is just enough for the BJCP Saison guidelines. The color looks awesome too, I'd expected it to be more golden, but it has a reddish tint to it for an SRM about 12. I think it will be less cloudy after sitting in the bottles for a few weeks. One good thing about testing recipes with small 2 gallon batches, is that you lose about 2 quarts in the process and don't have to wash so many bottles. Still, when you do create a winner, it's kind of depressing to drink that last one, knowing you have to start all over to get more. The lautering bucket has come in so handy. It held all the bottles, caps, etc. for sanitizing, then works great for bottle filling. Using a racking cane and siphon is so messy. I usually end up with ale all over the floor, counters, outside of the bottles, and in the drip pan I put the bottles in to try and limit the mess. Even with using the hemostats, which pinch off the hose really well, it's a juggling act. After filling, I leave the caps on top loosely to start the outgassing of the bottles to replace the oxygen with CO2. There's no way to test if this really works, but the ale does seem to foam more, so hopefully carbonation has started. I cleaned up everything while this was going on to give the bottles some time to themselves. Then I started crimping the caps. Got down to the third from last and the cap wouldn't go on. Popped it off and sure enough it was one of those darn Blue Moon bottles that had snuck into the pile. Fortunately I'd sanitized more bottles and caps than I needed. I think I'm going to love this Saison yeast. Just put the bottles back in the case and set it on the floor. No fussing with temperature control, since the house is around 82 degrees anyway, which is tolerable for .the Belgian Saison I Ale yeast (White Labs WLP565). I'm not sure why White Labs pegs the optimum temperature lower, but from peoples' experiences it seems to work well in the 80s too. I hope I'm right, since this will just barely be ready for the entry into the contest and if I'm wrong and have to drop the temperature, it won't be. 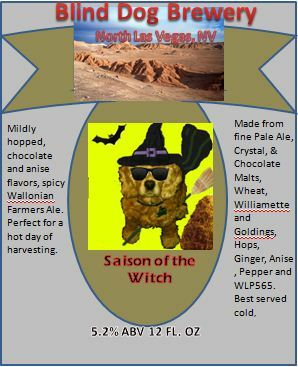 Going to bring my last available bottle of American Pale Ale over to Steve at www.vegashomebrew.com to see if he thinks I should enter it in the best use of hops category. I think the dry hopping came out perfect, but I'm biased. Looking at prior years' results, the IPAs carry the category, so I might be wasting my time. I'd surely rather drink it myself than enter it in a losing horserace. I'll update this with Steve's comments later. I'd bring it to the SNAFU meeting tomorrow, but with so much brew flying around the room, I'd rather him taste it with a clear palate and focus. Made up a new label for this Saison, starring Brooke.